MSR: You are involved in so many organizations! Why do you keep doing what you're doing? What motivates you? Sydney: I'm always going a mile a minute because I feel like I'm gonna go crazy if I stop. Don't get me wrong, though, I enjoy a break every now and again. I enjoy planning and executing events because I want people to enjoy racing as much as I do. I've threatened to quit organizing, but only if someone comes along who wants to take over the job. It's crucial to enjoy what you're doing otherwise you'll get burned out. And since no one has taken me up on my offer, I continue to find new ways to attract old and new drivers, put on exciting events, and just have some fun. MSR: Tell us a little bit about the organizations you’re involved with. Sydney: MSR Houston is the only membership race track in South Texas that offers an extensive membership program as well as opportunities for non-members to access the track. We pride ourselves on our Winter Challenge and Red Meat & Race Fuel series, plus our Charities arm has a highly successful Race 4 Charity twice a year. This past March, we went up against a popular Texas DE organization, and still sold out both our Novice and Advanced DE groups. The Houston Region SCCA has paved the way for other racing regions in the Southwest Division in more ways than one. We were the first to move to MotorsportReg.com. We were the first to introduce a Time Trials program in to our Club Racing program. And we run "twister" races- both directions in one weekend- clockwise one day and counter-clockwise the other. The Gulf Coast Vintage Racing Association is a new vintage racing organization we started last year. We basically put on fun events for those with older cars. We haven’t quite nailed down our final vision, but we try to be as inclusive as possible. We just finished our biggest event of the year at the Grand Prix of Houston. We had a small turnout on the Vintage side, but everyone had a great time, and we’ve already heard from others wanting to participate next year. MSR: What are some of the things your organizations are really good at? Sydney: I'd like to think that all the organizations I work with run really good events, but I think that the Race 4 Charity takes the cake. We developed the format six year ago, and it hasn't changed. We have DE groups and race groups. We've messed around and tried to include some other groups, but it didn't work, so we went back to the old faithful. Our upcoming event includes, for the first time, three DE groups (novice, intermediate and advanced), and two race groups (Challenge- SRF & SM, and Australian Pursuit Time Trial- bracket race for closed-wheel racecars). The event is time certain, it's affordable ($150, plus a donation- usually a toy or pet product or food), people have a great time, and it's for a good cause. Like I said before, we sold out our two DE sessions in March, so we're adding a third. Sydney: Probably the single biggest thing I've learned over the years is structured delegation. For this year's Grand Prix of Houston, we had eight specialty committees. Some committees work together, some have more than one chief, but overall I had about 10 people working on the event, as opposed to last year's four. It made a world of a difference. We had meetings where I set goals and expectations, and they reported back with progress. It was a load off everyone's backs. I've also learned to trust my gut. I've done this long enough to have faith that the choices I'll make are the right ones. And, when I do get questioned on a choice, I have the confidence to stand behind my decision. Sydney: Most of our promotion, across the board, is through email and Facebook. However, we have a very large word of mouth following as well. We try and put on quality events so our past attendees do the selling, without me doing the work! Sydney: The backside makes things soooo much easier. I've got the whole MSR Houston office on board, and we use it for everything from track events to reserved paddock registration. The process allows our members and guests to create profiles and easily register for events. The great people at MotorsportReg.com have helped the Houston Region & Southwest Division create our own forms and streamline the registration process at our events. The drivers and workers have nothing but great things to say about our process. Sydney: We utilize MSR for our reserved paddock reservations for big events at MSR Houston. I set up the vehicle so that the only car numbers available are the canopy and garage spaces we have available. We no longer have any issues with losing a reservation and double booking, or computer malfunctions. It's super simple, and we love it. MSR: Sydney thanks so much for taking time out of your busy schedule to talk with us. 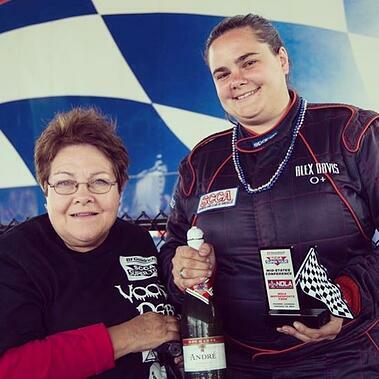 MSR Houston Charities believes in good community partnerships and to that end is holding their annual Race 4 Charity event on August 2, 2014 at MSR Houston. The race raises awareness and funds to directly support the local community charities in Brazoria and Harris counties that don’t receive national funding- ActionS, Inc., and LEGOS BUILD HOPE. The event is open to drivers of street cars and race cars, and the entry fee is only $150 plus a Lego set donation for LEGOS BUILD HOPE. You’ll get four 20-minute sessions on track in one of five run groups- Novice DE, Intermediate DE, Advanced DE, Challenge Races or Australian Pursuit Time Trial. Click here for more information and to register for this wonderful event. Know someone who would be interested in supporting this event? There are sponsorship opportunities available from $150 to $4,000, plus a silent auction in need of items. For more information visit the sponsorship page or contact Sydney.